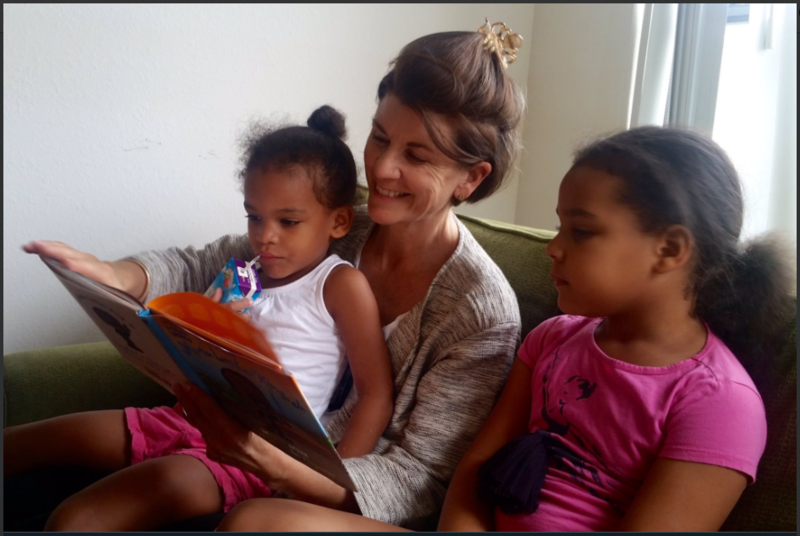 Amy Dickinson reading with two of her grandchildren. This is a special day for me, because this is the day I take a break from hosting your questions in order to advocate for a cause that is very near and dear to me: literacy. In my long career as a writer and reader, I have volunteered in classrooms, libraries, and prisons, reading with others and sharing the work of writers important in my own life. I do so in honor of my late mother, Jane, who passed along to me her own love of reading and writing -- first as a young child on our somewhat isolated dairy farm, and later as adults, when we shared books and letters back and forth, sometimes over great distances. This is a legacy I continue to happily share -- through the many books I recommend in this space, and also the two memoirs I have authored. What I learned from my mother's life-lesson is that when you have a book, you are never alone. Reading unlocks worlds of imagination and creativity. Literacy imparts real power, and this is especially important for people who feel powerless. The magic of literacy can happen at any time, but it is especially important in childhood. Reading helps a young child's brain develop and mature. Reading for pleasure is a lifelong gift of entertainment and learning. Today, in memory of my mother on her birthday, I joyfully share a simple idea that adults can easily adopt in order to give the children in their lives the gift my mother gave to me, by putting "A Book on Every Bed." 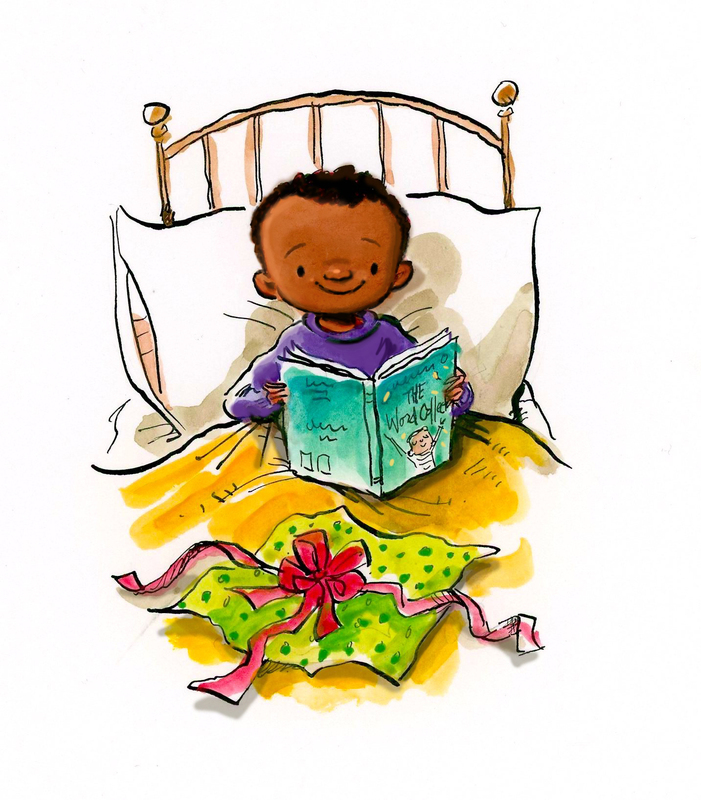 Here's what to do: On Christmas morning (or whatever holiday you celebrate), make sure that each child in your household wakes up to a wrapped book at the foot of their bed. The gift could be a new book or an old favorite from your own childhood. This year I am partnering with Children's Reading Connection, a national early literacy initiative founded in my hometown of Ithaca, New York. Their advocacy focuses on the importance of helping families to share books with babies and children. Even babies too young to talk tune in, in a deep and abiding way, when they are held and read to. This is an important prescription for health and success in growing brains -- and sharing a book is a wonderful way for families to connect. 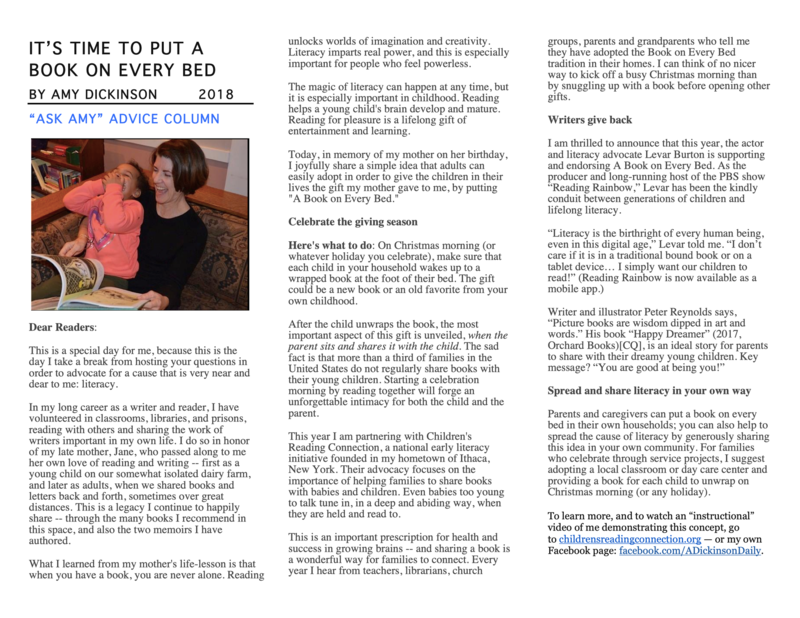 Every year I hear from teachers, librarians, church groups, parents and grandparents who tell me they have adopted the Book on Every Bed tradition in their homes. I can think of no nicer way to kick off a busy Christmas morning than by snuggling up with a book before opening other gifts. 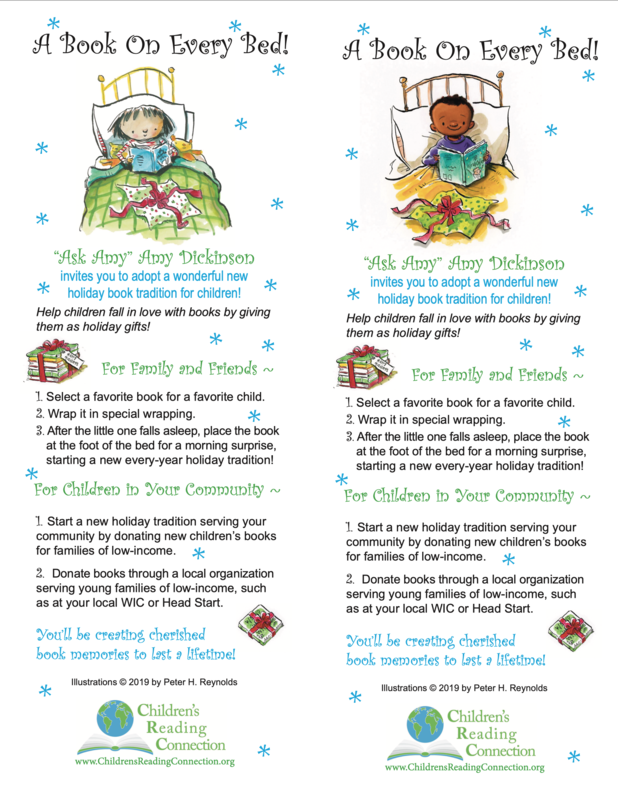 Parents and caregivers can put a book on every bed in their own households; you can also help to spread the cause of literacy by generously sharing this idea in your own community. For families who celebrate through service projects, I suggest adopting a local classroom or day-care center and providing a book for each child to unwrap on Christmas morning.